A Japanese nonprofit has unveiled the largest rehabilitation program to date in Karen State, with 1,250 homes built to resettle conflict-affected families. At the March 10 launch event in Lay Kay Kaw village – where 100 of the residential units have been completed – the Nippon Foundation said it was committed to helping Myanmar realize peace, and announced plans to continue with its rehabilitation project. “We have heard that there have been rumors that when the work here is finished, assistance from the Nippon Foundation and the Japanese government will stop. This is not quite correct,” said Yohei Sasakawa, chair of the Nippon Foundation and Special Envoy of the government of Japan for the National Reconciliation in Myanmar. He said that following the completion of the US$10 million first phase, scheduled for September this year, the Nippon Foundation plans to expand to a second phase with additional houses, schools, clinics and livelihood programs. 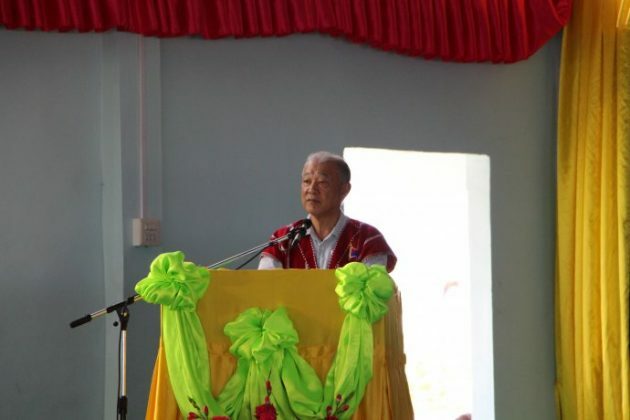 Mr Sasakawa added that the project was launched following a request from the Karen National Union (KNU). The Nippon Foundation worked in collaboration with the government and the ethnic armed organizations in Karen State. The first phase of the project encompasses 25 project sites in Karen and Mon states and Tanintharyi Region, and includes 1250 houses, 7 schools, 3 health clinics, 1 health center, 1 bridge and 5 wells, according to a Nippon Foundation press release. The Japanese Ministry of Foreign Affairs funds the project, and has donated the infrastructure to the state government and the KNU for free. “Our Rehabilitation Programme [sic] … is the first Rehabilitation Programme supported by the MOFA of Japan, and is the largest program of its type in these conflict-affected areas,” the release said. Naw Paw Lwe Mu, a former refuge who returned to Burma from the Umphiem camp in Thailand, recently moved in to one of the resettlement homes in Lay Kay Kaw. “There have been some difficulties in [accessing] education for the children and in obtaining health care. The school is very far. We expect more help not only for our children, but also for our health and occupation,” she told Karen News. The March 10 launch ceremony was attended by U Tin Myo Win, deputy chair of the National Reconciliation and Peace Center; Kayin State Chief Minister Daw Nan Khin Htwe Myint; State Minister of Border Affairs Colonel Aung Lwin; Ichiro Maruyama, Minister Counselor of the Japanese Embassy in Myanmar and General Mutu Say Poe, chair of the Karen National Union.